$25 Million Portfolio on Ocean Front Walk in the Press - Yo! Venice! Looks like the agents for the “Gingerbread” properties are starting to push them in the press, an “exclusive” story showing up today on GlobeSt that the three mixed use properties and parking lot are for sale with the asking price of 25 million. The properties are the same ones that Russian billionaire Andrey Melnichenko was rumored to be purchasing in 2010. The portfolio includes three mixed-use properties and one 19,000-square-foot parking/open-air retail lot for potential development. 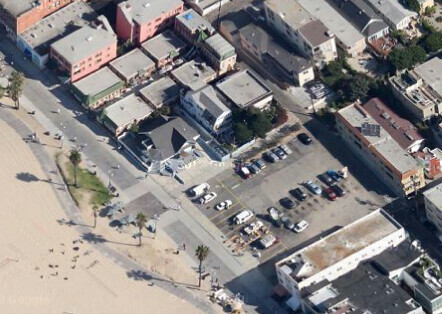 The properties are all located along the Venice Beach boardwalk and include 511 Ocean Front Walk, a three-story apartment building with ground-floor retail; 517 Ocean Front Walk, a two-parcel complex known as the Gingerbread Court, consisting of seven buildings containing ground-floor retail and second-floor office space; 523 Ocean Front Walk, also known as the Blu House, a beach bungalow with coastal and city permits for a variety of uses including residential, restaurant and retail; and 601 Ocean Front Walk, a commercially zoned vacant parcel totaling approximately 19,800 square feet, with current coastal entitlements in place for a mixed-use food court/retail building. The latter property is currently being used as a parking lot with open-air retail on the boardwalk. Click here to read the rest of the article on GlobeSt.